Ordinary number signature Pao VF about 295,000 - 301,000 baht. 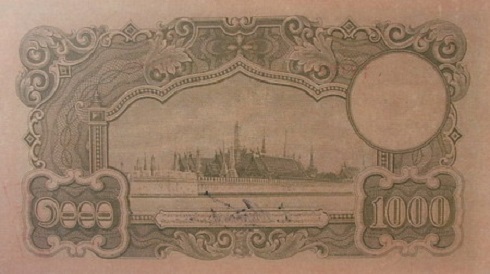 The 5th series 1000 Baht banknotes were announced on 11th September 1944. 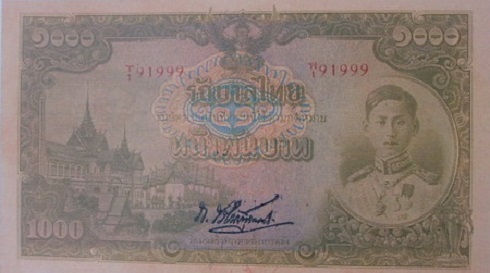 In the beginning of 1945, the inflation in Thailand was very hike. The Bank of Thailand tried to absorb the 1000 baht banknotes by exchange them into saving bonds. The government promulgated the saving bond in time of crisis act in 1945. One those who held 1000 banknotes could exchange the saving bonds and could redeem them in 12 months with 1% interest. The main object is the image of King Rama 8 on the right. The left is the image of the Chakri Mahaprasart and Dusit Mahaprasart Throne Halls. The middle is the "Thai Government" on guilloche design. The serial code and number were printed with red ink. The watermark image is the constitution on pedestal tray.